After being approved by Pandora's music curation team, Piuma Radio is now live on Pandora—click here to listen to the station! 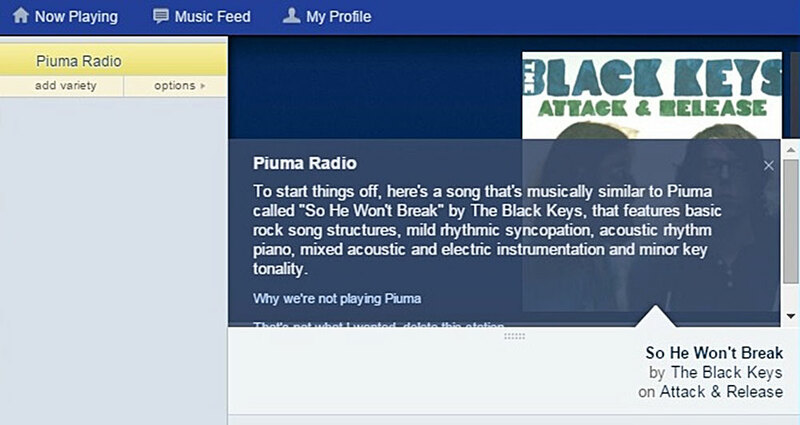 Pandora's Music Genome team analyzed the album and categorized it with these musical attributes: r&b stylings, rock song structures, funk influences, rhythmic syncopation, intricate melodic phrasing, mixed acoustic and electric instrumentation, extensive vamping (jamming/collective improvisation), electronica influences, subtle use of vocal harmony, minor key tonality, etc. Some of the artists that were played next were: The Black Keys, Mya, Buddy Guy, Vinyl Thief, etc. Check out the station for more!